Description: This plant has low sprawling stems (hence some call it Spreading Milkweed) and, like most milkweeds, has a white milky sap when the stem is broken. Look for blooms in June; the flowers are whitish-green with a purple crown in the center. Several varieties of milkweed are poisonous to livestock but Monarch Butterflies eat them. Where to Look: Find this milkweed on the upper and lower trails on the dry slopes among the Pinon and Juniper trees. -Fibers were combined with other materials to make textiles and twine. 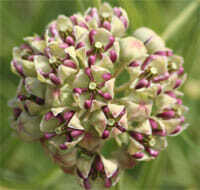 -In general, the Navajo used milkweed for nasal congestion, diarrhea, and ate plants raw or boiled. -Isletas ground the leaf and stem of milkweed and inhaled the powder for catarrh. 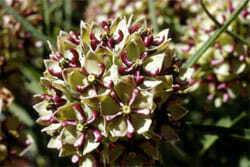 -Hopis used milkweed to help the flow of milk in new mothers. Description: A member of the snapdragon family, these bright scarlet, tubular flowers are a beautiful sight in mid to late summer. Also known as Scarlet Penstemon, Beardtongue, and Red Penstemon, the plant was named for its five stamens, one of which is a naked or infertile stamen that is bearded. Perhaps the most visible of the hundred species of penstemons in the southwest, Firecracker Penstemon often is confused with Scarlet Gilia, also popular with hummingbirds. Stems are up to three feet tall; blossoms are up to 1 1/2 inches long and appear mid to late summer. Where to look: This showy red flower appears along the upper trail at Chimney Rock. -Hopis used it in ceremonies, representing the East. -Navajos made a sweet drink from the flowers. 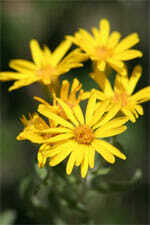 -As a poultice, reduces swelling, treats wounds. -Treat coughs, stomach problems, burns, menstrual pain. -Life medicine of the Navajos, used to induce healing. Description: Chimney Rock has three species of Four O’Clocks-the Desert Four O’Clock, Ribbon Four O’Clock, and Tufted Four O’Clock. Of the three, the Desert Four O’Clock is by far the most beautiful. 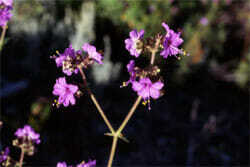 All have magenta flowers that are like small trumpets and they have anthers that extend far beyond the flared petals. Flowers bloom in July or August. The leaves are opposite and vary from species to species. Where to look: Desert Four O’clock is found on the road cut as you begin the climb to the upper parking lot. The other two are found in the upper parking lot area and along the lower trail. -Used to treat mouth sores, rheumatism, inflammation. -Hopis used it to strengthen the blood of pregnant women. -Older roots form an almost crystalline structure used to treat many ailments. -Navajos use the leaves and stems to make a beverage. 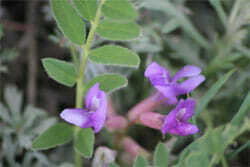 -Navajos use it to make a light brown or purple dye for wool. -Pueblo people use it to treat colic in babies, eye infections, muscle soreness, body swellings, rheumatism, or indigestion. 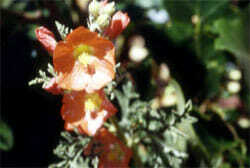 Description: The showy orange flowers resemble its close relative, the hollyhock. The foliage appears silver due to the star-shaped hairs on both leaves and buds. Plants may be from 1 to 2 feet tall with flowers appearing from July to August. Scarlet Globemallow leaves are 5-lobed and deeply cut while Fendlers Globemallow’s 3-lobed leaves aren’t. The central pollen-bearing column protrudes from its surrounding five petals. Where to look: Look in the plaza in front of the Great House Pueblo. -Poultice used to treat snakebites, bleeding, and skin disorders. -Hopis used it to treat gastrointestinal ailments and broken bones. -Leaves make a soothing poultice to reduce pain and inflammation. -Globemallow tea soothes sore throats and irritated bladder. -Pollen and seeds are edible, may have been a famine food-a food of last resort. -Pounded root pulp makes a plaster cast for broken bones or use to harden adobe floors. Description: Also called Goldeneye, here’s another plant whose hairy leaves give its foliage a grayish-green color. 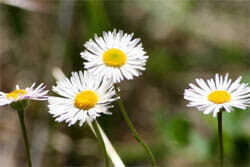 The flowers are less than 1 inch wide with daisy-like yellow ray and disk flowers on stems 1 to 2 feet tall. Stems are erect and plants form large rounded bushy mounds with 10 to 16 flower heads per stem. Blooms cluster at the end of these many-branched stems, appearing from July to October. Where to look: Along the upper trail, especially between the Guard House site and the Great House Pueblo. -Hopis used it to treat chest problems. -Navajos used it to induce vomiting. Description: This family of plants that adds beauty to the southwest is really sneaky. The actual flower is the yellow-green spike at the top of all that red. The 200-plus species of paintbrushes range from white to yellow to pink to rose but in all cases, what appears to be petals are actually bracts. Blooms and colored bracts appear from late spring through fall on stems 1 to 2 feet tall. The glowing appearance of the red bracts is due to shiny hairs. Leaves are also hairy, giving them a gray-green look. Not only does paintbrush lie about its flower color, it also is a parasite, extending tubes into the roots of other plants such as sagebrush, oaks, and grasses. Where to look: Both sides of the upper trail. -Used as a contraceptive by the Hopi. -Used to treat stomachaches by the Navajo. -Bathe in a paintbrush solution to relieve aches and pains. -Flowers contain sweet nectar which can be sucked out and enjoyed. 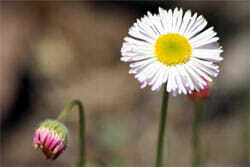 -Flowers were eaten but could be poisonous if there’s too much selenium in the soil. -Mixed with minerals, paintbrush makes a red and black paint used to decorate deerskin and gourds. Description: This member of the pea family is easily recognized by its seed pod looking like a close relative of fresh green peas in a pod. The flowers also resemble domestic sweet peas as do the leaves. Look for clusters of purple flowers in May and early June close to the ground. The compound leaves have 15 to 19 narrow leaflets and several leaves per prostrate stem. There are five species of milkvetches found at Chimney Rock. Where to look: Plants grow on the left side (ascending) of the upper trail just below the Great House Pueblo. – Although plant parts were eaten by Native Americans, some species are poisonous-high in selenium. Description: These members of the sunflower family are found throughout the desert Southwest. 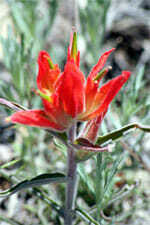 Most familiar is the Big Mountain Sagebrush, a woody member of this group. 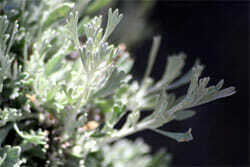 However, many of the sages are non-woody species that are easily recognized by their silvery-green, finely cut leaves. These plants are not the herb used in cooking (That’s a member of the mint family). The best way to identify this group as a whole is to crush their aromatic leaves and sniff. Fringed sage is one of four species found at Chimney Rock. Less than two feet tall, it has tiny leaves and appears as a mat. 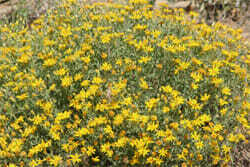 Big Mountain Sagebrush is more shrub-like-up to ten feet tall with yellow flowers. 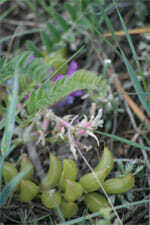 Its three-toothed leaves can be an inch long and, like other sages, are gray green. Where to look: Look for these common plants along the upper trail, especially near the Great House Pueblo. -Puebloans used it for digestive problems. -Navajos used it to treat headaches, stomachaches, coughs, and colds. -Makes a yellow or gold dye. -Ancestral Puebloans used it over roof beams to hold dirt for second story. -Chew leaves to induce vomiting. -Inhale steam as a decongestant or smoke as an anti-depressant. -Use bark for weaving and for fuel. -Flowers, seeds, and leaves are edible. 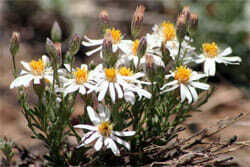 Description: While there is a resemblance to the Whiplash Daisy, the Sand Aster has droopy white ray flowers and the yellow central disk flowers are raised. The hairy gray linear leaves end in a tiny spine. The bushy plants, 3 to 4 inches tall, bloom from May to August with a single flower on each stalk. Where to look: The best stand is found on the left side of the upper trail, just past the curve after the 600 year old dead Pinon pine on the right. -Infusion of twigs and leaves used as steambath to induce sweating for colds. 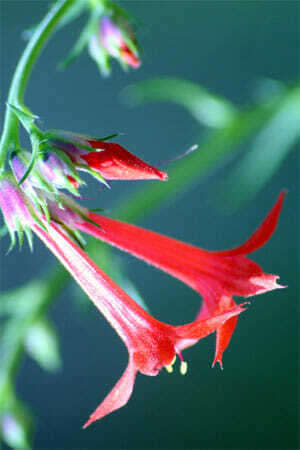 Description: Also known as Skyrocket or Fairy Trumpet, this plant is often confused with Firecracker Penstemon, although the plant overall is shorter-1 to 3 feet tall. Both have brilliant red flowers. 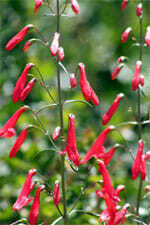 However, Scarlet Gilia’s trumpet-shaped flowers flare into five evenly spaced points while Penstemons have tubular flowers with 2 petals up and 3 petals down. The Rufous Hummingbird does not arrive at Chimney Rock until its favorite flower, the Scarlet Gilia, is in bloom, late spring to early fall. Leaves are alternate and finely divided. Where to look: Look along the side of the road driving up to the tour area. -The Navajo use a dried leaf solution to treat stomach problems. -Hopi women drink a boiled leaf mixture after giving birth. -The Hopis believe a leaf extract will ensure good luck in hunting. 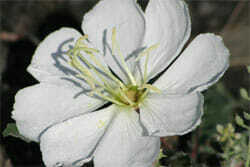 Description: Also known as Fileree or Cransbill, this member of the geranium family has leaves that are deeply lobed. The flowers are small and delicate, resembling rose petals, generally two to a stem. 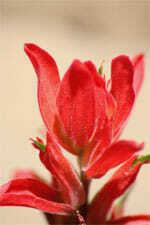 Each delicate bloom has 5 petals and 5 sepals. 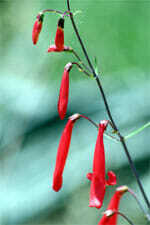 Blooming begins in April and may run to August, producing the long, beak-like seed pods that give the plant its name. Foliage starts with a ground-level rosette, then grows erect but spreading. The leaves are feathery and toothed with hairs. Where to look: This low grower is common along the upper trail and around the parking lot on the High Mesa. -Used as a diuretic or an astringent for bleeding. -Gargle as tea for a sore throat, inflamed mouth, or tonsillitis. -A poultice eases joint inflammation. -Freshly sliced root relieves gum and tooth infections. -Young plants are edible as a salad ingredient. Description: This large, showy flower can be up to 4 inches across. The paper white blooms open late in the day and usually close by mid morning. The collapsed bloom resembles a used paper hanky, often taking on a pink tinge as it ages. 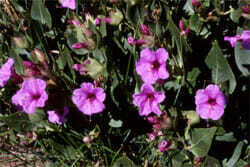 Appearing in May, the blossoms are on short stems; overall, the plant is no more than 6 inches tall. 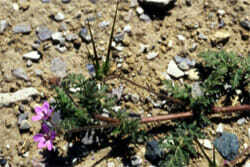 It prefers rocky ground for the underground runners which form new plants. Immature plants start out as a flat rosette. This 4-petaled flower attracts its chief pollinator, the sphinx moth, to the lemon scented nectar and cross-shaped stigma in the center of the flower. Where to look: This primrose blooms along the cut banks of the road on the way to the High Mesa parking lot. -Roots and tops make a soothing and antispasmodic cough syrup. -Root and leaves serve as a diuretic, laxative, or sedative. -Used to suppress pain, especially stomachache. -Makes a liniment for treating boils. -Edible as cooked greens or boiled root as vegetable. -The Hopi smoked the leaves as a tobacco and used it to prevent colds. Description: It’s a daisy and a member of the sunflower family. This spreading plant grows close to the ground in a dense mat. It is easily recognized by its spreading hairy branches and its many small, white, daisy-like flowers that bloom throughout the summer. The blooms consist of many white ray flowers surrounding yellow disk flowers. Tip the bloom over and the bottom has a pink to lavender cast just like the buds. 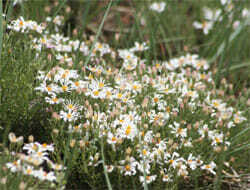 The other daisies frequently seen at Chimney Rock are the Spreading Daisy, Showy Daisy, Easter Daisy, and Oxeye Daisy. Where to look: This composite flower grows along both the upper and lower trails on bare soil. -Used by the Navajos for female problems such as menstral pain. -Also acted as a contraceptive. 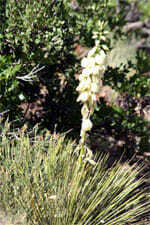 Description: The Banana Yucca was likely the single most important wild plant to the Ancestral Puebloans. This family of plants has multiple leaves extending from a ground-level central stem. The sharp tip on the leaves is its only armor and gives rise to Banana Yucca’s nicknames, Spanish Bayonet or Spanish Dagger. 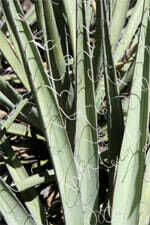 Even Great Plains or Narrow Leaf yucca is sometimes called Spanish Needles. The leaf rosette may reach 2 feet tall but the flower stalks can extend to 5 feet in height with many yellow-green to creamy white, lily-like flowers appearing June to July. By mid summer, those flowers have turned to large, fleshy green fruits on the banana yucca. Flowers can be creamy to yellow green and are bell-shaped. Both types yield large black seeds. Banana yucca leaves can be up to 3 inches wide; narrow leaf yucca leaves are up to 1 inch wide. Leaves are evergreen but the shedding that occurs along the outer margins of the leaves gives them a gray to white appearance. Where to look: A prize specimen grows along the road to the High Mesa Parking Lot. 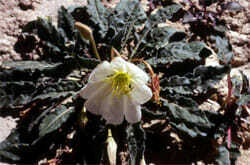 -The flowers and sweet fruits were eaten and may have been an important part of the Ancestral Puebloan diet. Yucca bananas could be eaten green or dried and stored for winter use. -The large fleshy root was the main source of soap. When pounded, the saponin in the root produces suds that can be used as a hair shampoo or for other cleaning jobs. -The leaves were soaked, then pounded with stones to extract the fibers which were then twisted to fabricate string or rope, sandals, and sleeping mats. Left attached to the fiber string, the needle-sharp tip could be used for sewing. Cloth made from yucca cordage sometimes incorporated fur or feathers in the weave. -Yucca leaf was chewed until the tip was finely frayed, then used as a paintbrush.